Get to know Icelandic nature and Reykavík city. 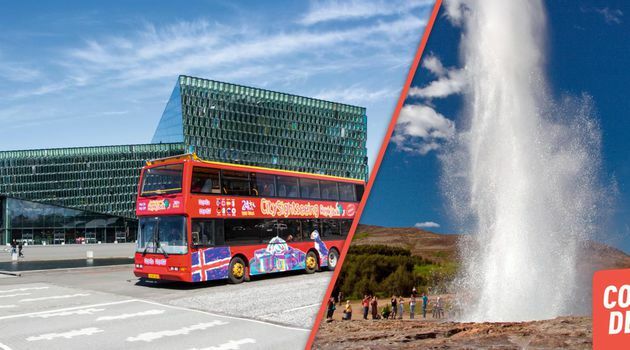 This combo deal begins with an 8-hour Golden Circle, where you will visit three of Iceland’s most famous sights and learn about growing pesticide-free tomatoes with geothermal water and then you can go and explore Reykjavík at your own leisure on the Reykjavík Sightseeing Hop On Hop Off bus. The Golden Circle includes Geysir geothermal area, Gullfoss waterfall and Þingvellir National Park. At Geysir geothermal area you can see the geyser Strokkur shoot a column of water up to 30 metres (98 ft.) into the air every 4-8 minutes. Gullfoss waterfall is a step waterfall, created by the glacial river Hvítá, and tumbles and plunges into a crevice some 32 m (105 ft.) deep. We also visit the historical and geological wonder that is Þingvellir National Park, where the American and Eurasian tectonic plates are pulling apart at a rate of a few centimetres per year. Additionally, we visit the Friðheimar greenhouse cultivation centre, where we learn about the magic behind growing delicious, pesticide-free tomatoes with the aid of geothermal heat which Iceland has in abundance. We arrive back to Reykjavík in the afternoon. You choose the date and time you want to go and explore Reykjavík in our Reykjavík Sightseeing Hop On – Hop Off bus.